This summer, FOUR PAWS, with the support of Ukrainian authorities, freed bear cub Nastia — who had been illegally sold by the Ukraine’s Lutsk Zoo to animal traders — and brought her back to her mother. 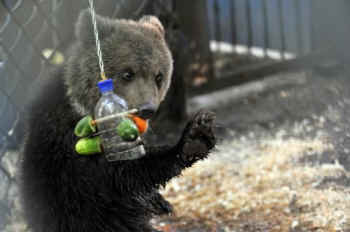 In May 2012, the then four-month-old female bear cub was brutally snatched from her mother and forced into a transport box that was much too small. 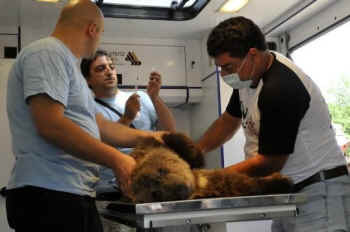 Animal traders had bought her for use as a tourist attraction: they could pose with the baby bear for a small fee. Video footage documents the cruel kidnapping. Throughout the disturbing offense, the bear cub screamed continuously and tried to resist her tormentors, while her mother ran to and fro in her cage, panic stricken. Upon her rescue, FOUR PAWS’ project leader and veterinarian Dr. Amir Khalil examined Nastia on site in his mobile animal rescue ambulance. Although Nastia was saved by FOUR PAWS, the question remains whether she will be recognized and again accepted by her mother. 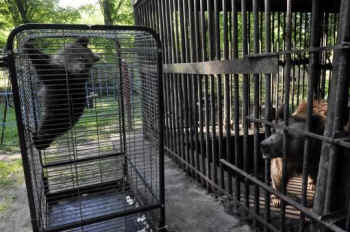 She has been placed in a cage next to her mother, and FOUR PAWS experts are watching both bears closely in order to decide whether they can be reunited. The road to recovery will be a long and hard one. But FOUR PAWS will help Nastia all the way. Her enclosure at the zoo will definitely be a temporary solution, since the zoo is desolate. FOUR PAWS will try to get mother and baby to a species-appropriate environment as soon as possible. In the meantime, the volunteers and the bear experts are cleaning and improving the enclosures to make their temporary home acceptable. In the last few months, FOUR PAWS, together with the Ukrainian authorities, has rescued four bears who were living in terrible conditions.